The first full version of the Corporate Human Rights Benchmark was published yesterday, with key findings on companies in the apparel, agricultural products and extractives sectors. The results reveal that there is a race to the top in business and human rights performance, but only amongst a welcome but small cluster of leaders. The great majority have barely left the starting line, with 40 of the 101 companies surveyed failing to show any evidence of identifying or mitigating human rights issues in their supply chains. CHRB measures how companies perform across 100 indicators based on the UN Guiding Principles on Human Rights. It uses publicly available information on issues such as forced labour, protecting human rights activists and the living wage to give companies a maximum possible score of up to 100%. In this year’s ranking, two-thirds of companies scored less than 30% overall. However, members of the small leadership group from the 2017 Pilot Benchmark have continued to compete to be the “best in class”, and each has made progress to ensure they do not fall behind direct competitors. The most challenging news from this benchmark is the lack of significant progress on last year by the majority. There is an unacceptably large group of companies who are not doing enough and appear content to hide in the pack of under-performers. …..First, leading companies are beginning to gain greater access to cheaper capital, based on their lower human rights risks. The fact that sustainable investment funds have effectively doubled in size each year since 2012 demonstrates the growing appetite for companies that manage their environmental and social risks. And this year Danone successfully pioneered a $300m social bond that attracted investors focused on ESG risks. Second, faced with the collapse of public trust in global markets, governments are beginning to exert themselves with increasingly bold steps toward regulation for mandatory transparency and due diligence. Good practice by leading companies emboldens timid governments to raise the minimum floor of corporate behaviour through regulation and incentives. This should be welcomed as it outlaws the reckless cowboys in every high-risk sector. Third, we see civil society and investors using the results of the benchmarks to exert pressure on laggard companies and recently a number of investors have teamed up, privately, with campaign groups to ensure that harder-hitting shareholder resolutions are raised at the AGMs. These pressures look set to grow and spread over the coming years. This is essential. With humankind facing extraordinary transitions – to zero-carbon economies, to automation and gig economies, to mass migration, all amidst the challenges to democracy and open societies – the Corporate Human Rights Benchmark will be one key assessment to press companies to play their full role in helping create a more sustainable and prosperous future for all. 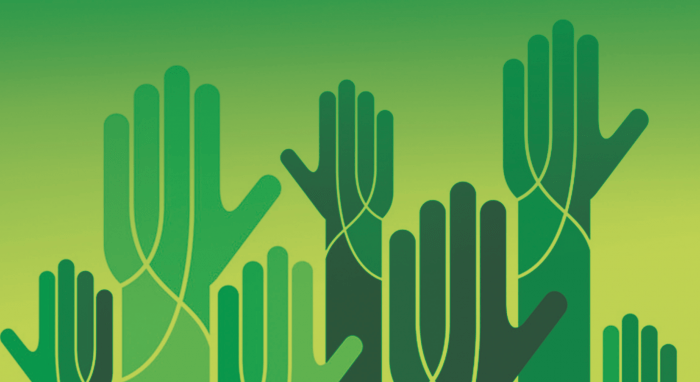 Equally our association now with the World Benchmarking Alliance will ensure that human rights in business is unavoidable if companies want their operations to be recognised as playing a part in delivering the Sustainable Development Goals. Misael is one of the five human rights and environmental defenders joining the London Mining Network for a week of action 12-20 October around the annual shareholder meeting of BHP Billiton, the world’s largest mining company. He will be speaking at events, meeting anti-coal campaigners in County Durham and holding BHP executives to account. The London Mining Network, which highlights justice, peace and environmental issues related to extractive industries, is supported by religious and missionary groups with experience of the problems in countries where they work. Most of the world’s biggest mining companies, and many smaller mining companies, are listed on the London Stock Exchange, and on its Alternative Investment Market (AIM). Communities all over the world are rising against mining violence and building alternatives that offer truly-sustainable futures, assert people’s rights and are deeply rooted in custodianship of land and water. This week of action will be an opportunity to explore this resurgence. They call for the UK government to commit to a Binding Treaty on Business and Human Rights to end corporate impunity. As the world’s largest multinational mining company, Anglo-Australian-owned BHP’s AGM is an important moment to build these arguments. BHP’s record of forced displacement, dispossession and catastrophic environmental damage stretches back decades. The company is so powerful it is seldom held to account for this devastation, while indigenous, Afro-descendant and peasant communities are hardest hit. 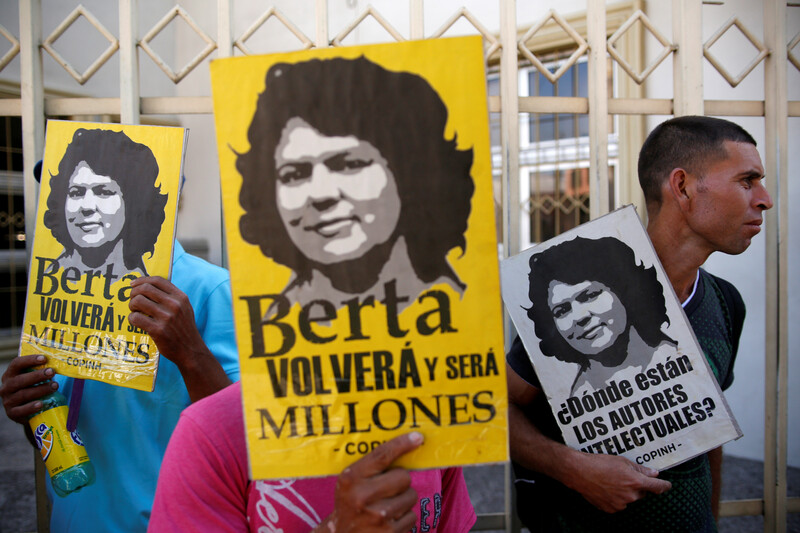 How can companies take concrete actions to protect human rights defenders? 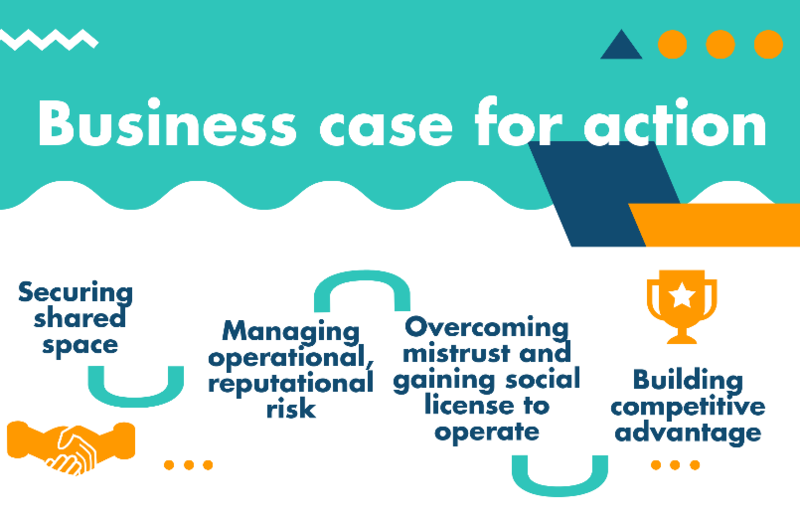 Published a few days ago by the Business & Human Rights Resource Centre and the International Service for Human Rights, this new guidance was commissioned by the Business Network on Civic Freedoms and Human Rights Defenders, seeking to encourage companies to focus on an increasingly inescapable agenda. ..Data from around the world shows there is a concerted attack in many countries on the essential freedoms and the rule of law on which business and civil society depend. 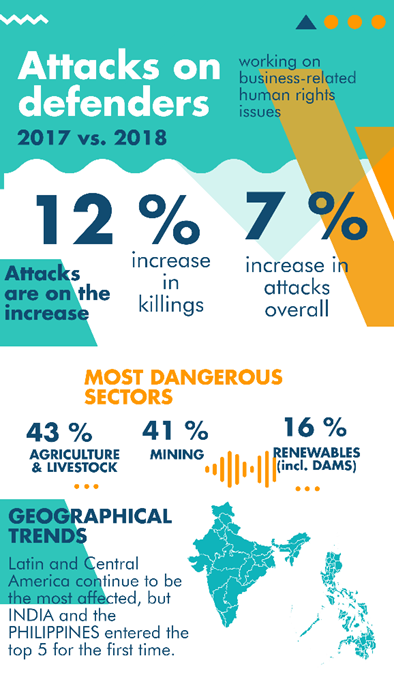 And the defenders and organisations who expose the risk of abuse by companies in their operations and supply chains are under particular attack. Business and civil society operate in and benefit from a ‘shared space’ defined by common, fundamental elements. The rule of law and freedom of expression, association and assembly are essential to the realisation of all human rights, to good governance and accountable institutions. These elements are also critical to stable, profitable and sustainable business environments in which companies thrive and economies prosper. Yet this shared space is as much an ideal as it is a reality. But why, when and how should business engage on this urgent agenda? This guidance represents a major step forward towards business action. It is a practical guide to realistic action by responsible companies, investors, industry associations and business leaders. It is informed by pragmatism and the principles of freedom and fair play. It is also the result of over 90 interviews with business leaders, investors, civil society advocates and other international experts who gladly offered their insights. This side event will take place during the UN Forum on Business and Human Rights. 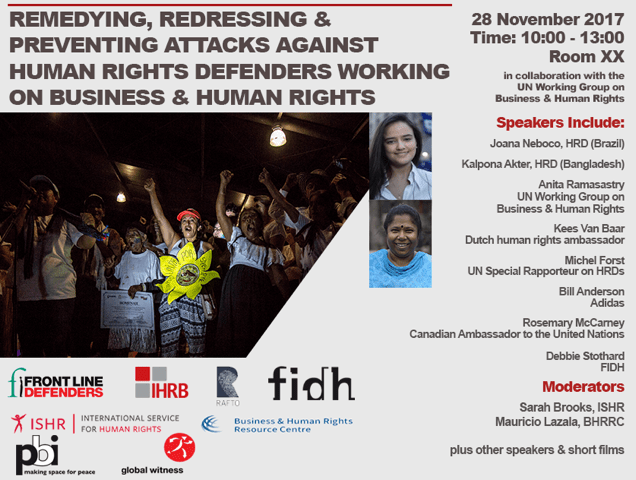 The event will bring together multiple stakeholders to discuss how to remedy, redress and prevent attacks against human rights defenders working on business and human rights.